A 63-year-old East Ipswich night shift worker has won a $388,000 jackpot at Ipswich Jets Rugby League Club. 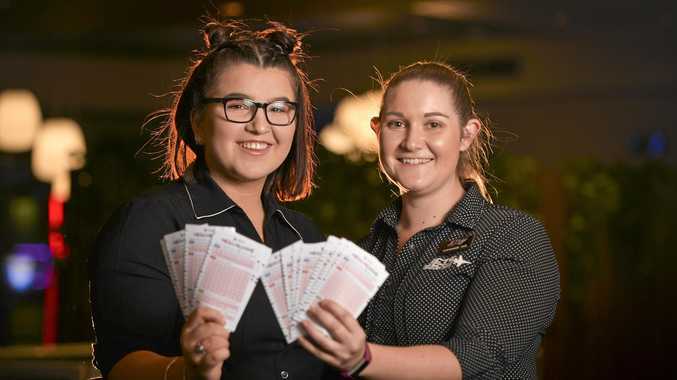 The mother of two and grandmother of five, who wished to remain anonymous, was out for dinner with her husband on Saturday night when she bought the winning ticket, and watched in disbelief as she matched all nine of her numbers. "I don't think it has sunk in yet. It's just unbelievable," the winner said. "I was very calm. I probably won on the third game but I waited until the other games played out. It was good just to sit there and take it in. "My husband said, 'you're going pale. You're all pale and sweaty'." The winner won with an unusual combination of numbers that she chose herself and had been playing for about four weeks. The winning numbers were 17, 18, 19, 20, 41, 42, 43, 44, and 45. She spent just $20 on the winning ticket, playing 20 $1 games. The winner said she wasn't ready to retire yet but plans to use the cash prize to pay off the mortgage on her unit. "It's nice because now we can do the little bits and pieces that we haven't been able to afford," she said. Keno's Queensland Manager, Brian Laws, congratulated the winner, saying the wonderful thing about Keno was how people used their money to improve their lives. "We love to hear that Keno can change the lives of its winners in such positive ways, like being able to own your own home," Laws said. Last year was Keno's 20th anniversary in Queensland.